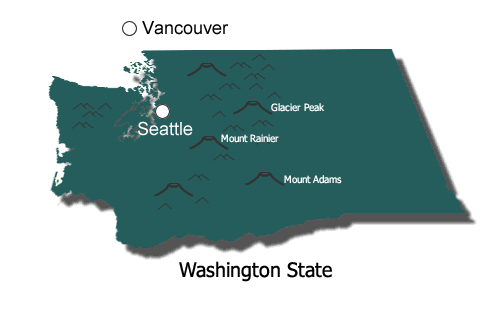 This presentation documents an adventure in the beautiful and varied wildlands of Northwest Washington State, in August of 2002. Along for the ride was myself, Markus Wandel, and Peter Krug. We sampled much of what the area has to offer, from the Olympic coast to the Cascade Volcanoes to the rugged North Cascades. Our activities including coastal hiking, spelunking, hiking, backpacking, scrambling, and mountaineering. Come join us for a brief look at our adventures. You can navigate to the various sections of this presentation by clicking on the circled destinations on the map above, or by using the navigation icons in the left-hand sidebar.